See, I’ve always loved to make big one-pot meals, usually with the idea that they’ll be leftovers for another night. The downside? Sometimes towards the end, those leftovers seem less than appealing. And it’s not that there’s anything wrong with them, it’s just that once we get out fill of whatever dinner it is, we’re kinda done with it. One of the best ways to deal with that is to freeze half of a large meal, right up front (that’s easy meal prep) while you are still kind of excited about it. But in the case of any meal made with a pork roast? The second best is to refashion it into these sandwiches! You can make your Shortcut Philly Roast Pork Sandwiches from just about any leftover roast pork. The idea is that you’ll take that pork, simmer it to lusciousness, add provolone (and traditionally, broccoli rabe) and serve it with its own au jus. Leftover Porchetta, a herby delicious pork roast is really a great choice for these sandwiches that lean towards Italian, but really any pork roast will do. The sandwiches will pick up just a little flavor from however you originally do up your roast, which makes it kind of fun. If you’re starting out with a huge roast and cooking it as they do in the sandwich shops, Philly Pork Roast Sandwiches are going to be made a little differently. If you’d like to see more about the original, Serious Eats has quite a review. This recipe, since it starts out with leftover roast is really a shortcut and it’s really more of a method than a recipe. So you get to make as many sandwiches as you want, or as few, depending on the amount of pork roast you have, how many people you want to feed, and how generous you want to be with each portion. When I made these sandwiches for the photos, I didn’t use the traditional broccoli rabe, which is kind of a bitter green and sets off the buttery richness of these soft pork sandwiches and the ooey, gooey provolone cheese beautifully. That’s because these were made in the winter and there was no way I was finding broccoli rabe at my store! I also served them on buns, since this is a leftover recipe and that’s what I had on hand instead of sub or hoagie rolls. Maybe I’m taking too many liberties to call them Shortcut Philly Roast Pork Sandwiches. Maybe I’ll just call them delish, instead! Because you’ll be working with already cooked or leftover pork, which is a great shortcut, this recipe is just a cinch to make. You’ll just simmer that pork gently in a good broth to heat through and soften into lusciousness. The pork is tasty and the broth picks up a good amount of richness and flavor from the pork, so it’s great for dipping. If your roast is already soft and tender and just about falling apart-y, it just takes minutes to heat through. If you’ve served a roast that’s not cooked to that stage, just use more chicken broth and give it a little more time and it will reach that perfect stage for these sandwiches. As a matter of fact, this recipe would be great made not only with pork roast, but to refashion pork chops which can be notoriously dry when reheated. Slice it thinly and heat it gently and you can redeem even those! I just used chicken stock to make these sandwiches, and the jus is best with a good one. If you have any juices from your pork roast, consider whether you want to add them or not, for just a bit more flavor. Since I had no broccoli rabe for these particular sandwiches, a little parsley stood in. Ok, so the whole recipe is really a money-saving proposition – to take something that might be destined for the bin and refashion it into something you’re really going to be excited about. If broccoli rabe is too pricey or not available, Swiss Chard or another tender green will be a good substitute. In my case, I just added a little parsley that I bring indoors every winter. You can pick up your rolls at any price point, from sesame-studded hoagie rolls to the cheap, soft grocery store buns I used. There is something to be said about pork on a squishy type hamburger bun! If you’re buying grocery store type cheese, it keeps well unopened for several weeks. Pick up several of the types you use when it’s on sale so you have it at the ready to cook with. Adjust oven rack to middle about 6 inches below the broiler. Arrange rolls on rimmed baking sheet. Bring 1/2 cup water to boil over medium-high heat in 12-inch nonstick skillet. Add broccoli rabe, oil, and salt. Cover and cook until just tender, 3 to 5 minutes. Uncover and cook until water evaporates and broccoli rabe begins to sizzle, about 3 minutes. Add garlic and pepper flakes and cook until fragrant, about 1 minute. Transfer to plate and set aside. Add pork, chicken broth and parley to now-empty skillet. Cover and cook over medium heat, gently, stirring occasionally, until hot, about 5 minutes if the pork is already tender. If the pork isn’t, use a little more broth and simmer until it is. Divide pork, broccoli rabe, and provolone among rolls. Broil sandwiches until cheese is melted, watching closely. Serve with the broth for dipping. 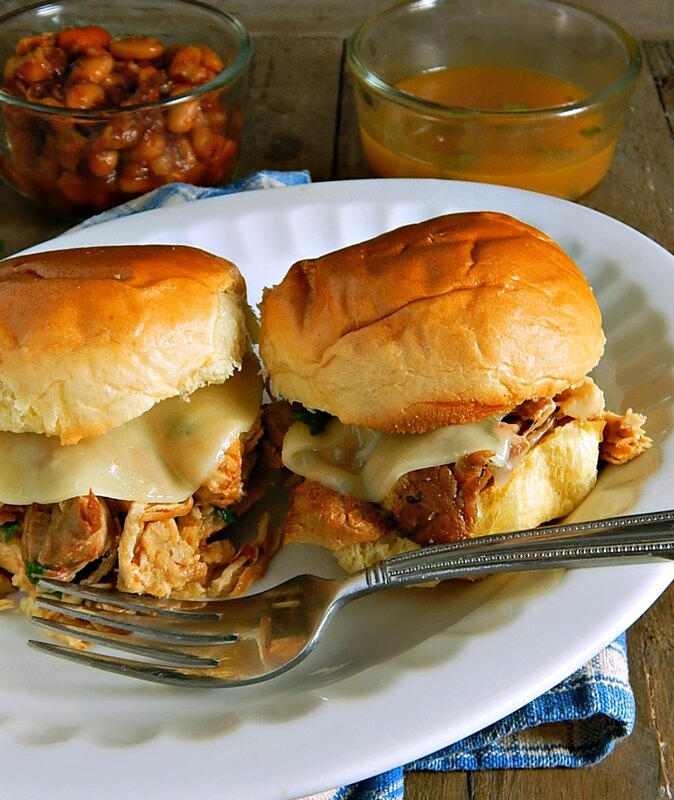 I’ll be sharing Shortcut Philly Roast Pork Sandwiches at Fiesta Friday #269. It’s co-hosted this week by Moi and and Ai @ Ai Made It For You. This entry was posted in Click here for Fabulous Food Posts and tagged Cheese, Chicken Stock, leftover pork, Pork, provolone, Sandwiches. Bookmark the permalink. WOW these look truly delectable. Thanks! There are some things on my site that I just crave every time I look at them – these are one of those! Will you please just adopt me already? They look delicious! They were good, Gail! Thanks! A great way on how to revive left over roast pork. This looks delicious. Sounds wonderful! A great use of leftover pork roast. Thanks, Robin! These were the best! 🙂 I am hoping for leftover pork now whenever I do a roast.